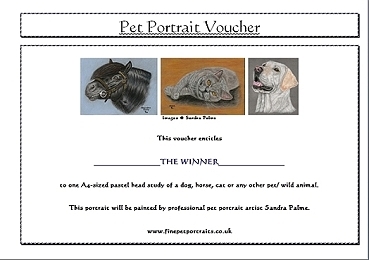 You would like to give someone a portrait of their beloved pet but can’t get hold of a photo? Or you are not sure which of the photos you’ve got the recipient would prefer? Or maybe you’ve left it too late? Personalised gift certificates are now available and make ideal Christmas, birthday or wedding gifts! I just need the person’s name and maybe the pet’s name as well and I can e-mail you the voucher on the same day. Then you can print it on photo paper, frame it and it’ll be a fab present on the day! Plus there’ll be the actual pet portrait that the recipient can look forward to. simply click here to contact me! Give someone a very special and unique present that they will enjoy for years to come!